Accuflex is a product we use to produce our full flake system. This product will give and "flex" a bit, unlike some epoxies. We apply this system mainly in garages and basements. 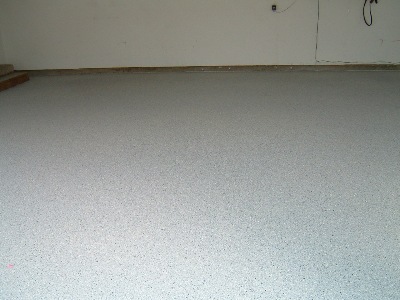 With this full flake system we can make your floor any color you desire with a combination of flakes. It works great for areas with foot traffic, industrial environments, and light car traffic. 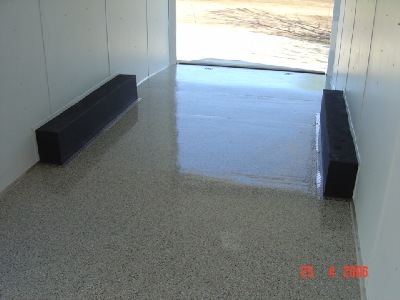 It is also a very useful coating for trailer floors. If a full flake floor is not what you desire, a random flake floor is another option. This system works well in garages, basements, and industrial environments. Methyl methacrylate resin is a top of the line coating system. These benefits make it an excellent choice where other coatings fail in harsh environments such as car washes, food preparation and heavy industrial areas.